Thomas is a big timer. 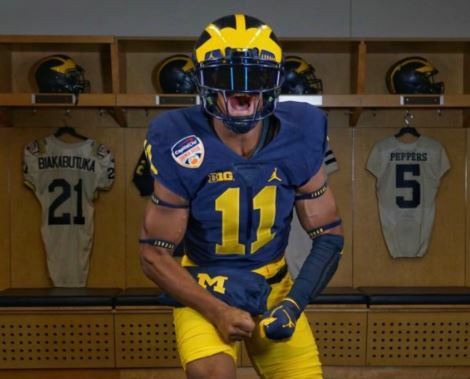 He’s one of the most physically impressive recruits in the class and should only continue to grow into a freak athlete with time at IMG and in Ann Arbor. 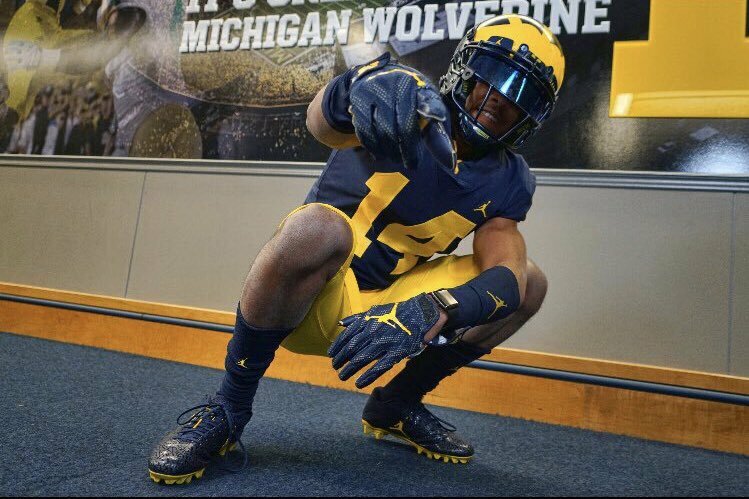 His athleticism, instincts and physical playing style should make him an early contributor, fan favorite, and future “Dude” for Don Brown’s defense throughout his collegiate career. 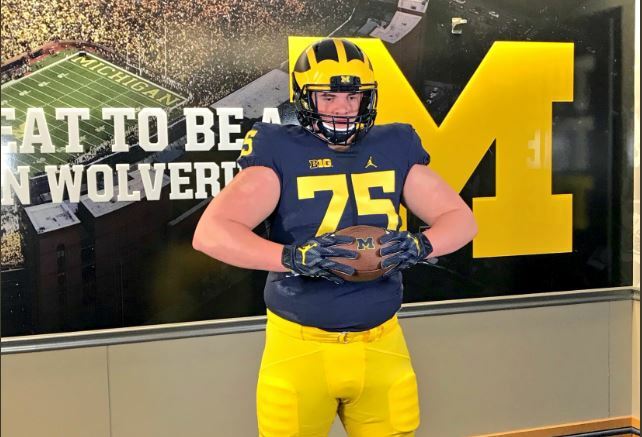 Rumler is one of those old-school offensive lineman that Michigan has been known to have throughout the years. Since his freshmen year of high school, he’s been a dominant, physical road grader and has continued to improve into a more well-rounded lineman since then. 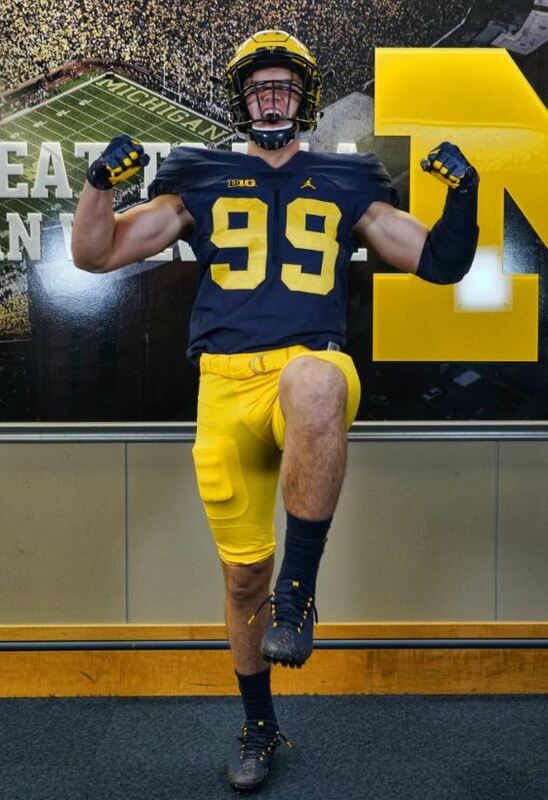 Though there’s plenty of time to go until he actually enrolls at Michigan, he has the look of a multiple year starter in the Maize and Blue. Whether that’s at guard or tackle is remained to be seen. Hinton is one of the best high school football players in the country, regardless of class. His mix of size, strength, athleticism, and physicality makes him a dominant force on the defensive side of the ball. But it’s not just his physical talents that make him stand out. Being the son of a former NFL standout definitely hasn’t hurt as he has a nose for the ball and an understanding of the game that truly separates him from the rest. Though he’s expected to come in as a defensive end, he could easily grow into a defensive tackle. Either way, he should be a good one. Jones is a big, physical lineman that played the majority of his snaps on the right side of the line. He shows good bend and athleticism throughout his junior tape, excelling most on run blocking as he just physically dominates a lot of defensive ends. And though that’s normally not too big of a shocker for a 6’5” 290lb high schooler, Jones and Grayson HS play against some of the best programs in one of the most talented states in the country on a weekly basis. 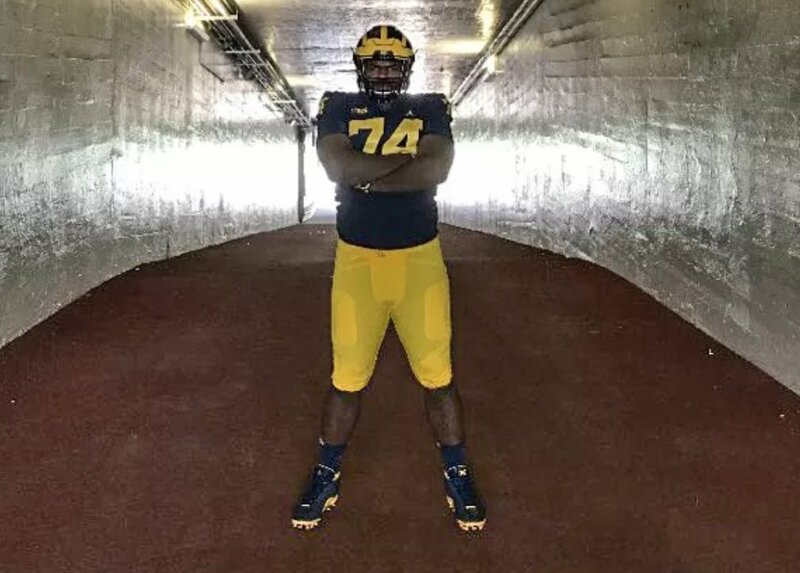 He still has plenty to work on as he’s pretty raw as a prospect, like most lineman, but he also has all of the physical features and tenacity to develop into a good lineman in college. McNamara’s skill set matches his offer list. He isn’t the biggest, fastest, strongest armed quarterback but he excels in all of those aspects. With a similar style to other shorter, not super-athletic, pocket passing quarterbacks like Drew Brees and Jake Fromm, he shows off fantastic pocket awareness and the ability to make all the throws.throughout his tape. That includes throws from different levels, angles, with pressure, and on the run. He still has to tighten up his mechanics and decision making under pressure but you can see why the top programs and coaches in the country offered him. Newburg may only be rated a three-star prospect but his mix of size, strength, and tenacity makes him a very promising prospect. 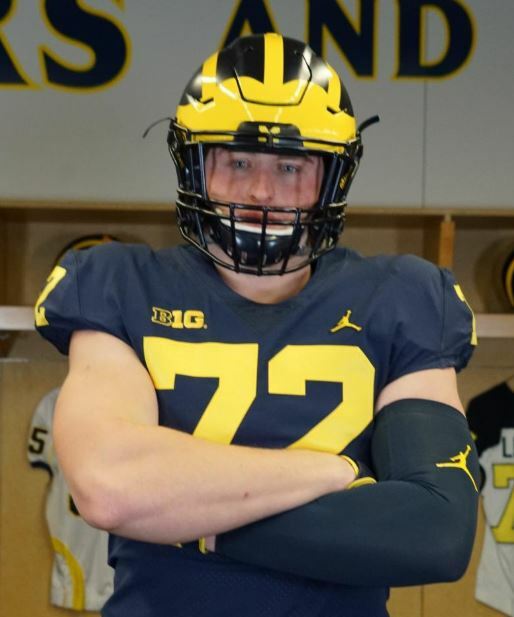 Add in his go-to spin move, that gives offensive lineman fits, and his quick first step, and he’s a guy who could be a nice addition to Greg Mattison’s defensive line depth. With an elite frame and a wrestling background, time spent in the weight room and with the coaching staff could turn him into a productive force in pass rushing situations. After the first 30 seconds of Stewart’s junior highlight tape, I asked the age old question, “how is this guy ranked this low?”. Stewart is a big, athletic, physical tackle that can use his strength to open holes and his athleticism to get in the open field and clear a path. He also has a tendency to bury his opponents or drive them out of bounds whenever given the chance. He’s also a standout high school wrestler. Competition level is obviously part of it, as it is for most recruits, as is the fact that he’s not a recruiting camper. But either way, I’m not looking into that too much. 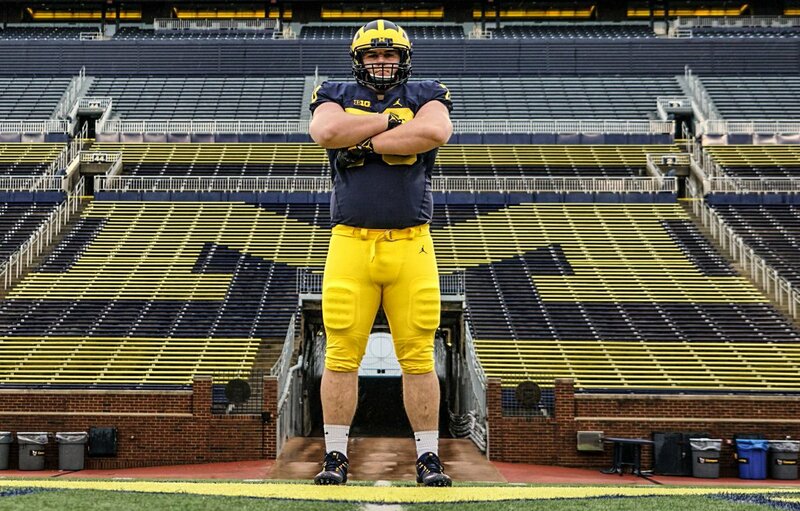 I believe Stewart has the natural size and raw talent to develop into a productive, versatile lineman for Michigan. Barnhart is a versatile lineman with the size and tenacity needed in a Big Ten offensive lineman. But he’s still pretty raw. He has the frame to add a good amount of size and continue to move like he does. As a basketball player, he has good feet and bends well but still needs to add strength. With some more time in the weight room, cafeteria, and on the practice field, he could be a nice prospect on the line. At what position exactly? He could play throughout the line but his athleticism may keep him on the outside. 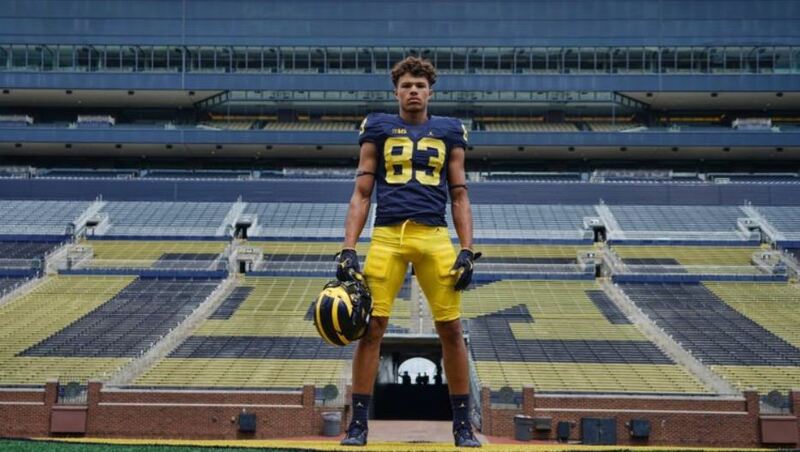 Velazquez is the perfect fit for Don Brown’s defense. He’s a strong, physical, athletic hybrid player that has the size of a safety but the physicality of a linebacker, which is pretty much the exact breakdown of Khaleke Hudson. He has a nose for the ball and can read offenses well from the safety position. All is a very intriguing prospect. He’s far from a finished tight end as he has plenty of size to add to his frame and things to tighten up with his blocking but he has the natural size, athleticism, route running ability and hands to be a problem in the passing game. Targeted by some as a wide receiver, he is a mismatch nightmare for cornerbacks because of his size and linebackers because of his fluidness. Luckily with the depth chart, he’ll have time to put on the size needed to play at the next level. 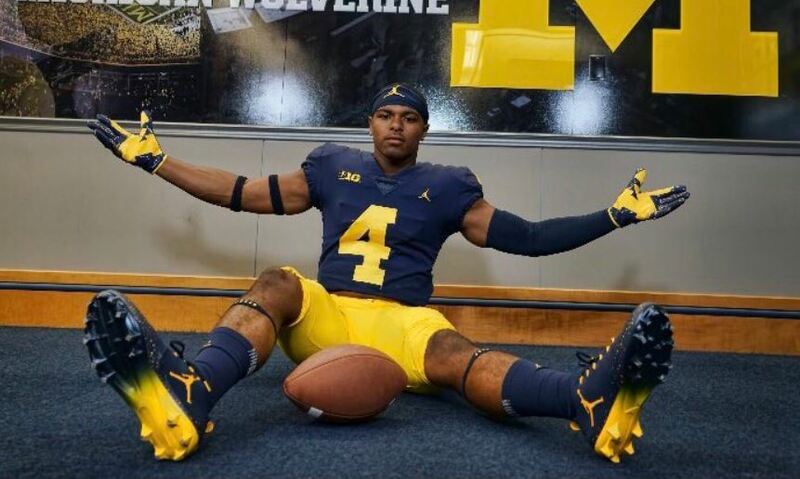 Once he does, he could become a favorite target for the Wolverines signal callers. I’m a big fan of Charbonnet’s game. He’s a strong runner that can change direction on a dime and shows off his agility on each run. He can bounce and cut with the best of them and has more than enough speed to beat defenders down the field. Though not the most physical running back in the world, he isn’t afraid to lower his shoulder and can break tackles with both his power and elusiveness. He’s a guy I see potentially contributing early on in his career if he can get the playbook and pass blocking down. Smith is a beast of an interior lineman. 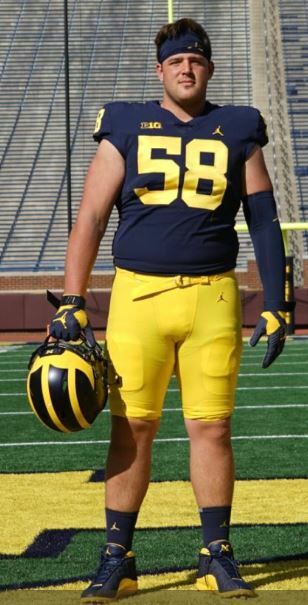 He’s big, he’s mean, he has a high motor, good feet, and looks to be a great fit at nose tackle for Michigan. 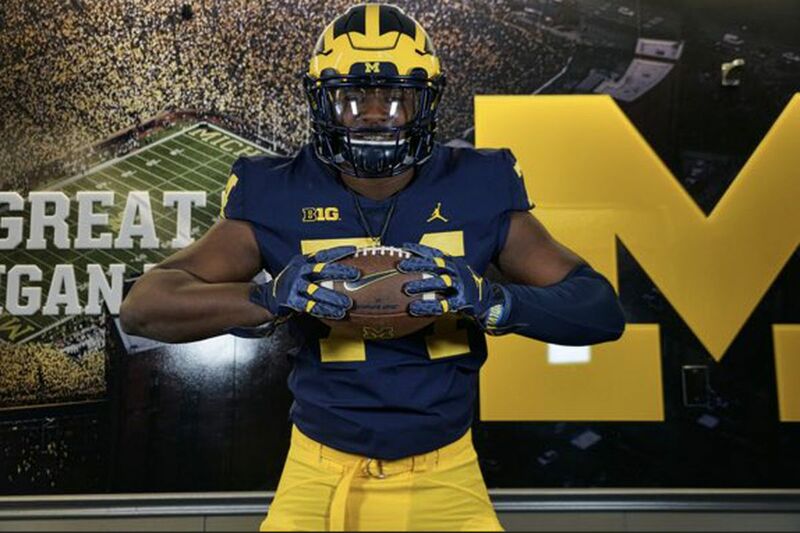 His ability to shed lineman and find the ball carrier to make plays in the backfield will give him a chance to play right away in Ann Arbor. The staff was in need of more depth at nose tackle and there may not have been a better addition in this class than Smith. It makes sense that he held an offer from Georgia Tech because he’d be a perfect fit in Paul Johnson’s flexbone offense. George Johnson, not Paul, is a dynamic dual-threat quarterback/wide receiver that flashes big-time playmaking ability. He’s not the biggest guy in the world but he’s tough and has a ridiculous burst. When he plants his foot in the ground, he goes and is hard to catch. Making the move from quarterback to full-time wide receiver/every now and then wildcat quarterback may take a little time. But he’s the type of player that you find a way to get the ball to. 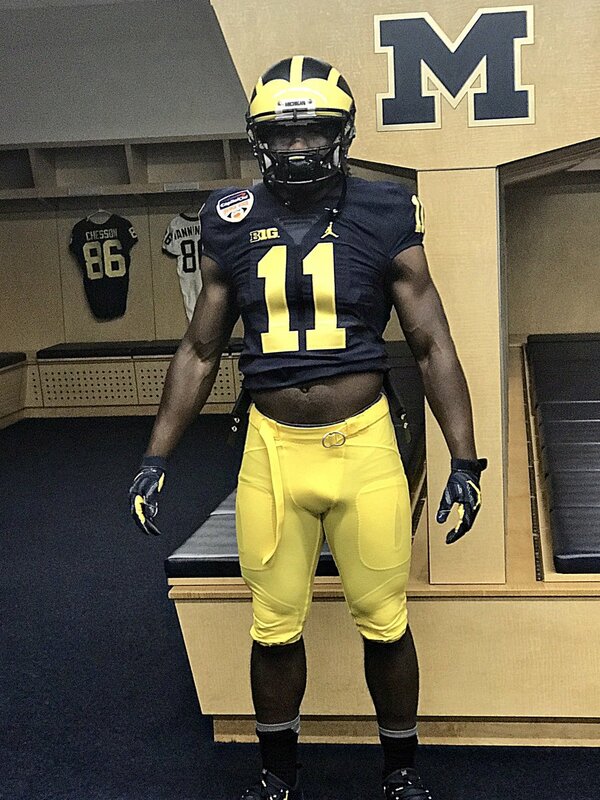 I wouldn’t be surprised if he’s a top return man option for Michigan at some point during his career. Ojabo is Nigerian-born and has only played one year of organized football in the United States after moving to New Jersey from Scotland. Though new to the game, he has all of the physical traits defensive line coaches are looking for in a prospect. He’s athletic with great size and a good motor. While he may start off at strong side defensive end, he has the frame to play on the inside once he puts on some more size. Johnson is another hybrid safety prospect that could play multiple positions in Don Brown’s defense. He can cover on the outside or inside from nickel, play up in the box to blitz, cover or defend the run, and can ballhawk from centerfield. 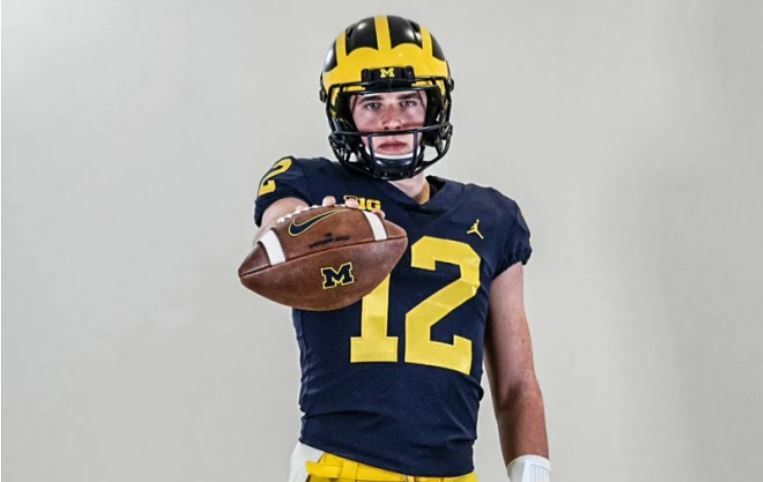 Johnson is also a standout on offense as his junior tape is full of him catching touchdowns from one-time 2018 Michigan commit QB Kevin Doyle. He’s the type of player that just knows how to make plays with the ball in his hands. 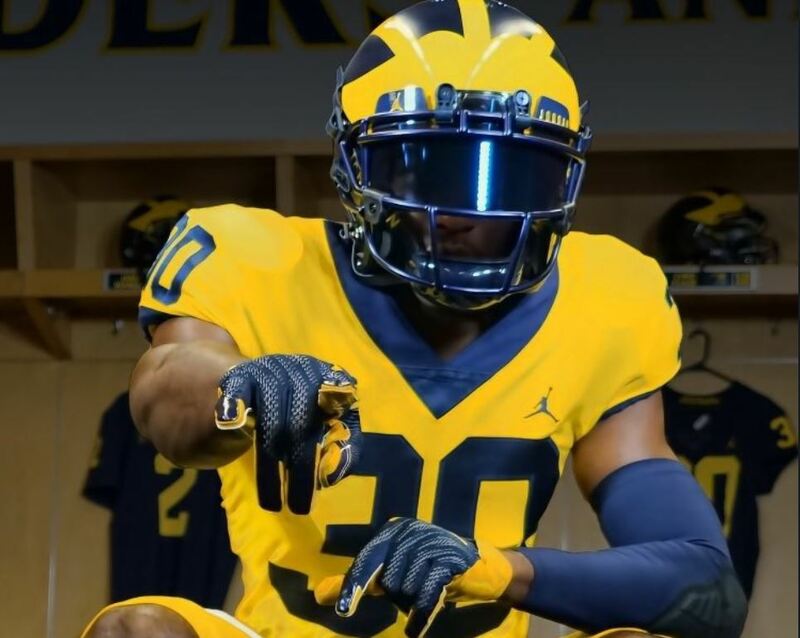 He may not have a set position but Viper or strong safety look like good fits in Don Brown’s defense. Morris is a big, tall lineman that has a frame that could put him at multiple positions depending on his future gains. He’s in a similar mold as former Michigan standout and current Baltimore Ravens DL Chris Wormley. Like Wormley, he’ll likely start on the outside at strongside defensive end/five tech and then move inside to defensive tackle/three-tech. His mix of athleticism and size will allow him to do just that, but I think it’ll be his arm length and ability to knock down passes that could make him a playmaker in the passing game. 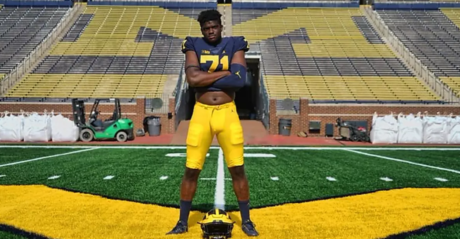 It may take a little time for him to contribute but with the training staff and coaching staff in place, he could have a big impact as a versatile defensive lineman during his time in Ann Arbor. Jackson may not be the biggest guy on the field but he’s easily the slipperiest. The tough-nosed slot receiver has the ability to stop on a dime, shake defenders, and go from zero-to-sixty at the drop of a hat. 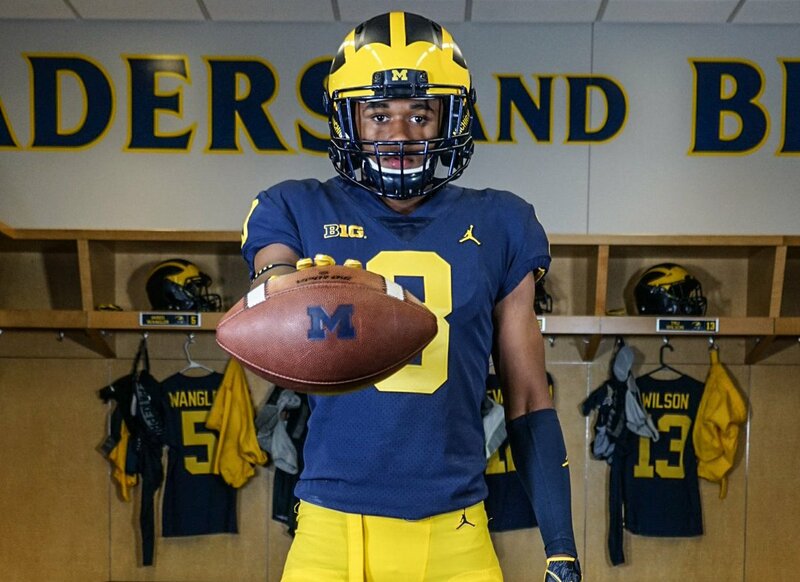 His speed and quickness make him extremely tough to tackle when he has the ball in his hands but he’s also a very good route runner and looks to fit in very well as a home run hitter for a Michigan offense in need of it. He could be used as a mismatch nightmare out wide, in the slot, or out of the backfield. At the very least, he should be a special teams dynamo as both a return man and a gunner. 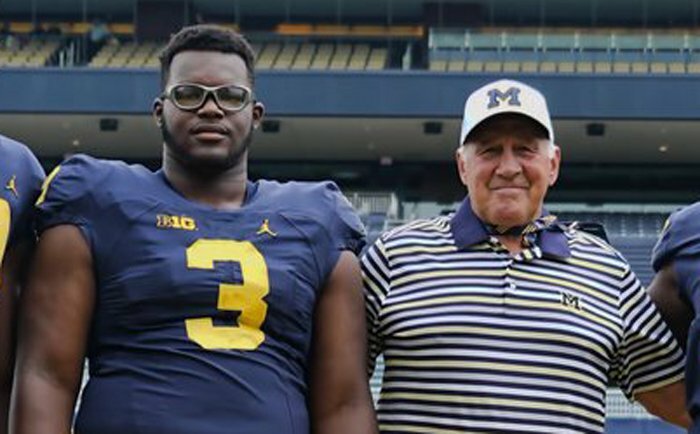 It doesn’t take long to see why elite defensive coordinators like Don Brown and Bud Foster want Sainristil on their respected defenses. He may not be the biggest guy in the world but his quickness, smarts, and his nose for the ball is something every secondary needs. 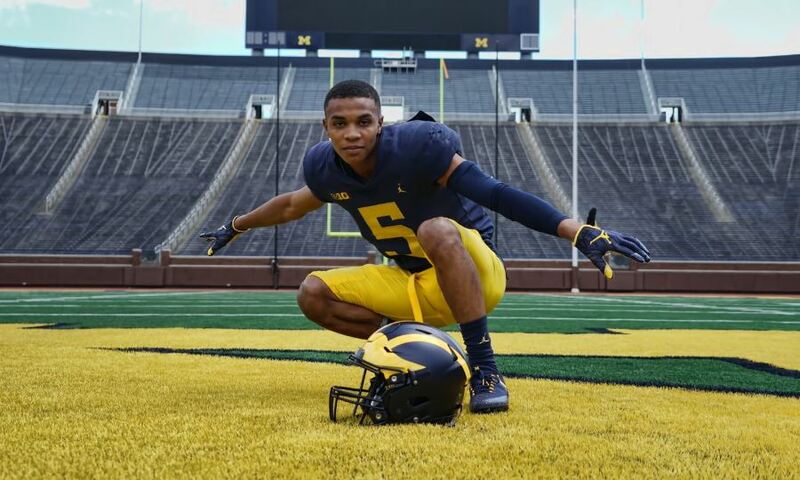 But he’s far from just a cornerback prospect and Michigan knows that well as he’s reportedly wanted by the offensive staff at wide receiver. Throughout his tape, he shows his raw explosiveness, footwork, and home run hitting ability in the slot, on reverses, out of the backfield and on returns. He’s a threat to score every time he touches the ball. Keegan is everything you want in a tackle prospect. He has good athleticism and feet for a player of his size and frame. He shows good strength and hands in both run and pass blocking, and plays with a mean streak that should translate well to Big Ten play. 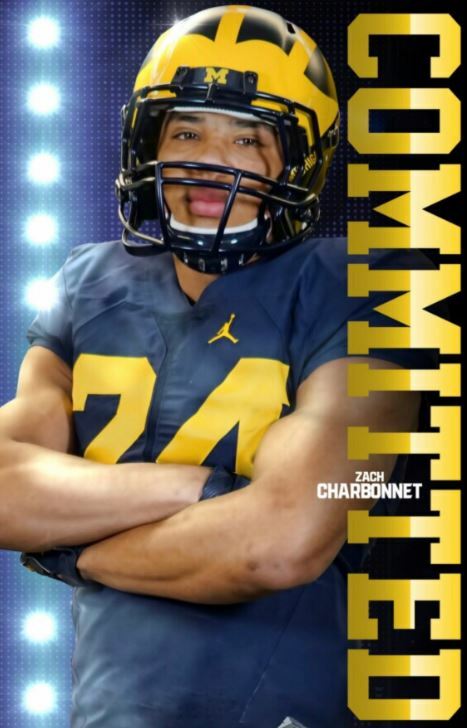 If he continues to develop, he could see the field quickly for the maize and blue. 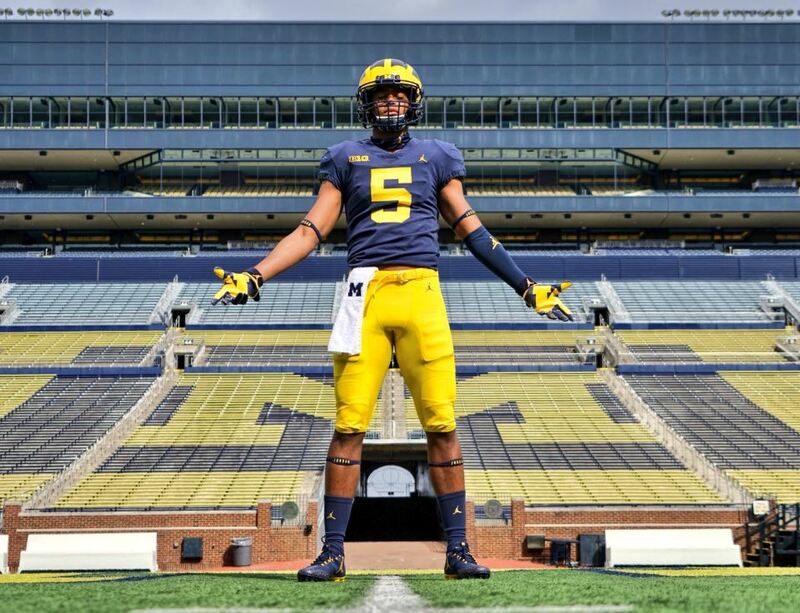 Solomon has the chance to be a really nice fit in Michigan’s defense at the Viper/outside linebacker position. He’s a really talented player that just hasn’t hit the elite size yet. He’s the type of linebacker that flies to the ball and shows a really nice ability to make open field tackles. His speed, tenacity are his best traits but can also be his weakness as he shows a tendency to over pursue at times. Going from sideline to sideline, blitzing off the edge, or covering tight ends and running backs are what he should excel at once he gets adjusted. Hill is one of the best safety prospects to come out in recent memory. He’s a well built, uber-athletic, uber-talented safety prospect with elite speed (verified 4.3 forty, 4.22 shuttle and 43.6 vertical). He can cover and he can play in space. He can play centerfield, on the line or in the box thanks to his mix of sprinter speed and linebacker-like physicality. Hill is pretty much the prototypical free safety prospect. 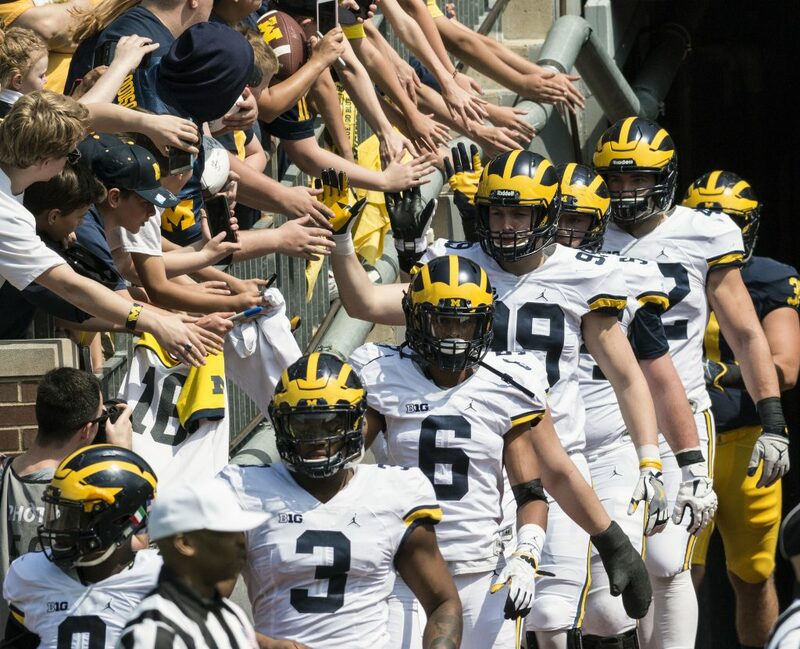 There’s a good chance he’s a known star for the Wolverines throughout his career. Johnson is a big, athletic receiver that plays with a bit of swag while showing off strong hands, a large catch radius, and the knack for making highlight reel catches. He’s also a good, strong route runner that knows how to get separation and has those long strides and burst to go get it. He has the look of a really good player during his collegiate career.